Space junk is a serious problem: it threatens satellites and spacecraft, and can plummet unpredictably to earth. Australia's Murchison Widefield Array is a high-sensitivity radio telescope that tracks space debris as small as 1 meter across, by observing how the objects reflect FM signals from Australian radio stations. It's listening to pop music from space. 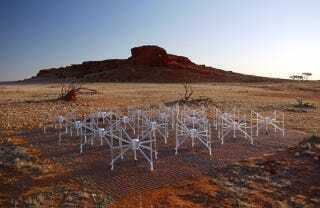 The array, part of western Australia's Murchison Radioastronomy Observatory, was built as a precursor to the proposed Square Kilometre Array being jointly undertaken by Australia and South Africa. As it stands right now, the Murchison Widefield Array consists of 2,048 individual antennas arranged in 128 four-by-four tiles. A single tile is pictured above.